David Jackson has again delved into the underlying psyche of Liverpool’s best and worst in Don’t Make A Sound and delivered a novel that ranks amongst the very finest around right now. A disturbing and oftentimes harrowing novel, this is the book that may well see the Wirral-based university lecturer take his place at the very top table. The haunted Nathan Cody is hunting the man who abducts little girls right from under their parents’ noses. Why have these girls been chosen and who’s taken them is what Cody must unravel and, in so doing, might just put himself in terrible danger. And then, of course, there are the clowns. David Jackson is fast turning into the master of building tension. Detail is the key, but never quite so much as the novel dips in pace. Quite the contrary. Don’t Make A Sound is infused with inciting incidents, yet many are so low key they may be taken as inconsequential, except for the fact each is vital for the continuance of that which transpires. Added to this is his ability to write snappy and totally credible dialogue which, when applied to Cody’s exchanges with Megan Webley in particular, takes even this quicksilver fast tempo up a notch or six. The city of Liverpool becomes a peripheral non-speaking character in its own right, with the vivid colour the author includes giving a three dimensional roundedness many other writers skimp on, much to the detriment of their work. There’s a clearly a deep love of for the place at work, yet Jackson insists on the Cromwellian approach: warts and all. As beguiling as the protagonists are, however, it is the antagonists that are those who really make the story sing from the very highest of boughs. Deeply disturbed yet preternaturally normal, the Benson’s – Malcolm and Harriet – are so beautifully drawn, never once do they come across as being stereotypically evil. Misguided, yes. Cruel, certainly. But not evil, not initially, although thanks to the subtlety of Jackson’s prose the slowly accelerating nastiness in which he injects them is nothing short of wonderful. Nathan Cody, Stella Blunt and Megan Webley are fine creations all. Yet without a truly compelling storyline their worth is worth little. 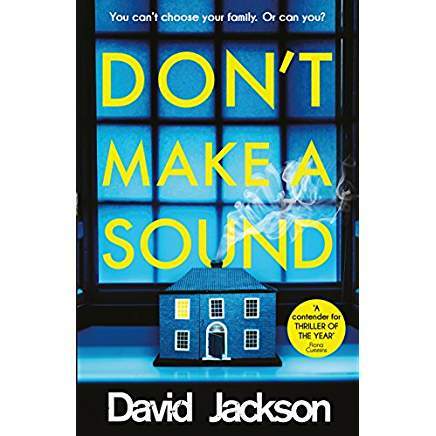 David Jackson in Don’t Make A Sound has once again delivered on all fronts and so makes this third Cody novel as unmissable as it is unputdownable.